The latest version of the Flash programming language is based on the ECMAScript 4 specifications (http://www.mozilla.org/js/language/es4/) and it introduces a new, more Object Oriented, programming model. This new approach may sound familiar to developers that already work with languages such as Java, C++ or Pyhton but it may also intimidate all those Flash designers and developers with less advanced programming background. One of the good things about this book is that its author, Sham Bhangal, has a great teaching style and he never leaves something unexplained. Every example and piece of code is accurately analyzed without rushing things, the actionscript code is always broken in small parts and then commented, also every chapter is well focused on one task which is then fully covered. We particularly liked this last aspect as every concept explained in the book has its own practical application, making it a lot more easier for the reader to grasp the idea being explained. Also Sham immediately introduces the reader to some very important practices like storyboarding, planning the project before writing the code, organizing the work flow and a lot more. In the book you will also find many images that will help you find the windows and panels that are being used as well as many diagrams and storyboard sketches. It seems that Sham Bhangal is a passionate retro-gamer as he devoted an entire chapter to "Sprites" where he will guide you in the creation of an arcade game (Zapper) in the style of the old-timer classics! Game developers will love it! Finally the last chapter is dedicated to more advanced topics such as Actionscript 2.0 Classes and components. Maybe we would have liked a better introduction to Actionscript 2.0 classes and the related OOP concepts instead of having a quick description in the last chapter. Also chapter 7 ("Objects and classes") should have focused a little more on classes instead of the old prototype object model. 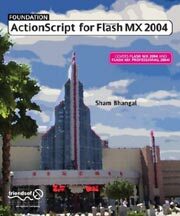 Anyways the book is higly reccomended to both beginners and intermediate users who wish to exploit the new features in FlashMX 2004. The book requires almost no programming knowledge and covers a wide range of topics and because of this it's also well suited for designers that have never opened the Actionscript panel before. As usual with Friendsofed books you will find all the source code files available for download in their website.